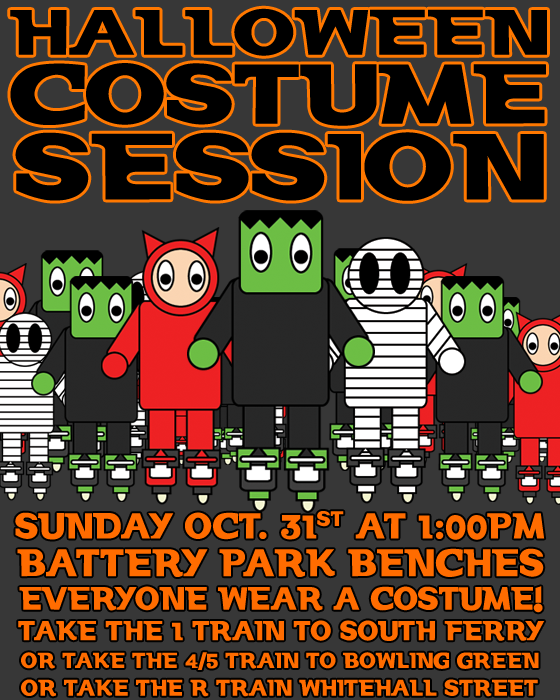 Location: Coleman Skatepark at 12:00PM. Street spots at 3:00PM. Spots announced via Facebook / Twitter for late arrivals. Prizes: $50.00 to best trick. $50.00 to best costume. Winners chosen at end of session. New Years Eve River Ave Skate Bash! 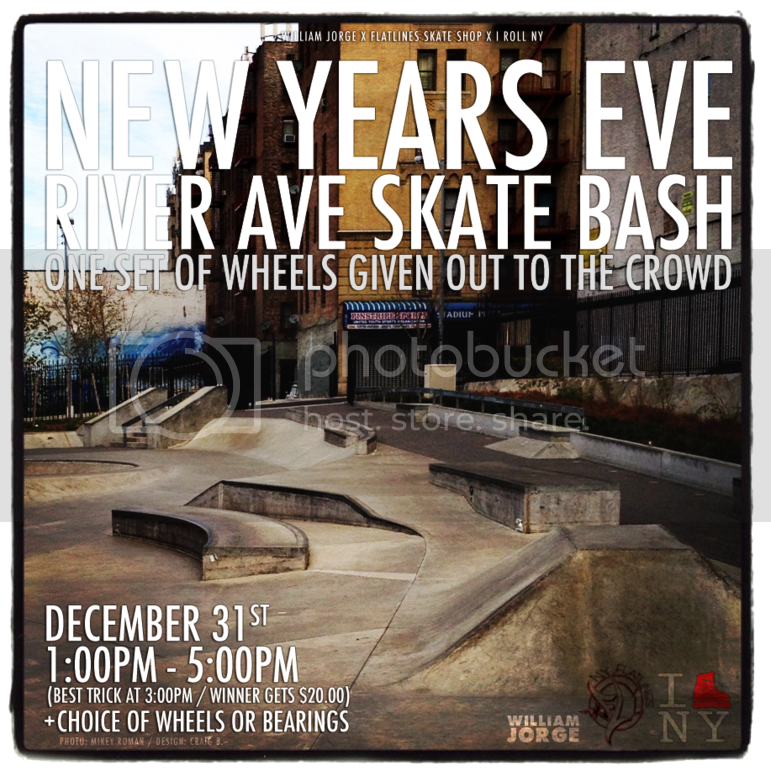 Celebrate the new year with one last mega session at the River avenue skatepark in the Bronx, NY. They’ll be a best trick contest (no fee to enter) at the flat down rail where the winner will get cash and their choice of wheels or bearings. There will also be a set of wheels given out to the crowd during the session. Directions to River avenue below. Time: Starts at 1:00PM. Best trick at 3:00PM. Train Directions: Take the 4 or D train to the 161 Street-Yankee Stadium/River Avenue train stop. Location: Battery Park benches. Followed by the marble ledges on Wall/Water street. 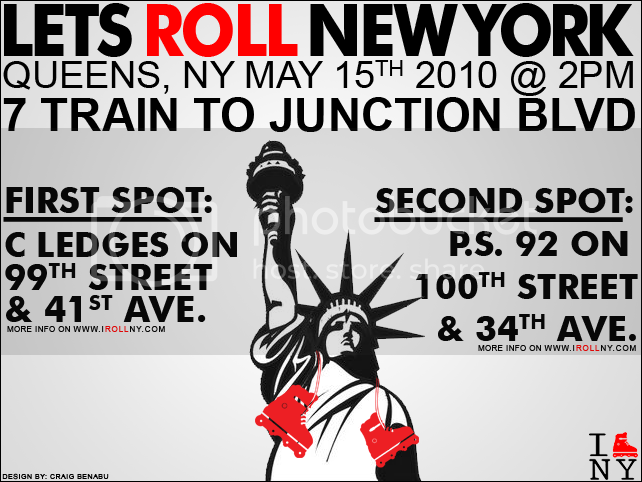 Train Directions: Take the 1 train to South Ferry / Take the 5 train to Bowling Green / Take the R train Whitehall street. Too Much Love Session This Friday! 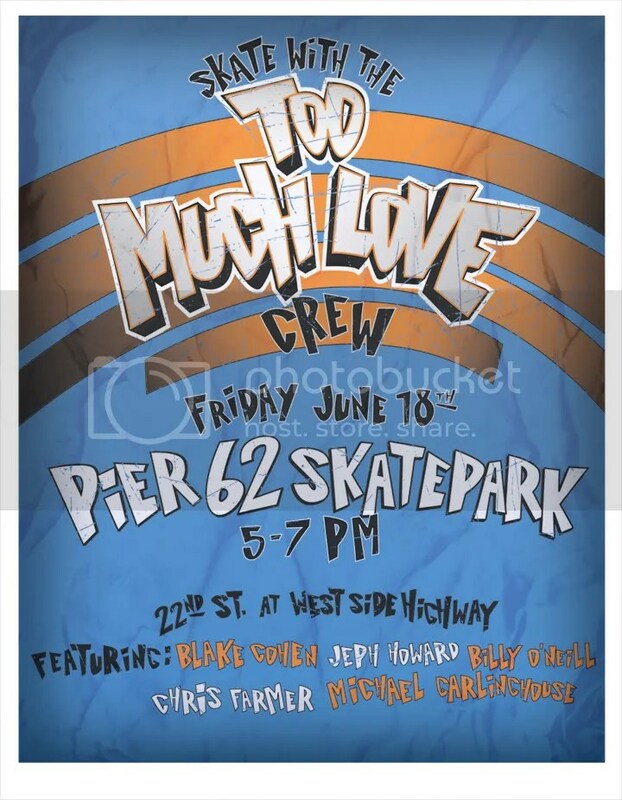 This Friday, June 18th, the Too Much Love crew will be skating at the Pier 62 skatepark from 5:00PM to 7:00PM. Come out and session with Blake Cohen, Jeph Howard, Billy O’Neill, Chris Farmer and Michael Garlinghouse. Pier 62 is located on 22nd street and 12th avenue in Manhattan, NY. The trains that will leave you closest to the area is the C and E train to 23rd street/8th avenue. Walking directions from the train to 12th avenue here. 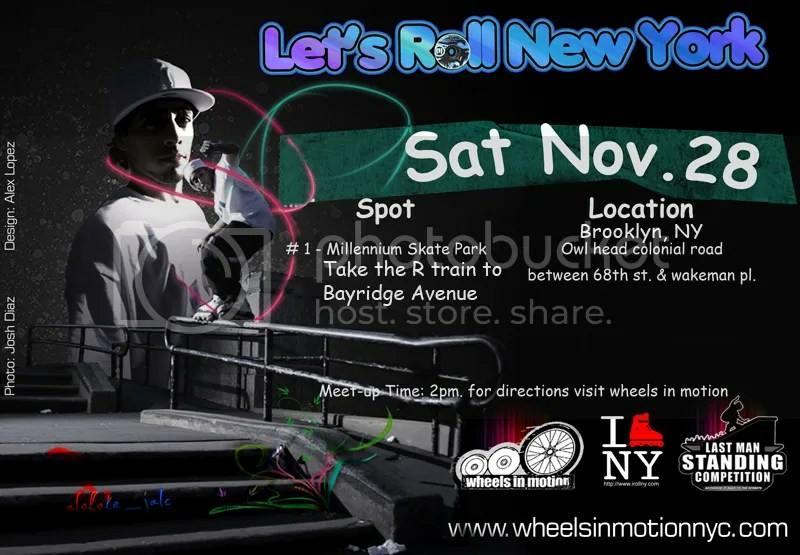 Lets Roll NY Session 9 This Saturday! 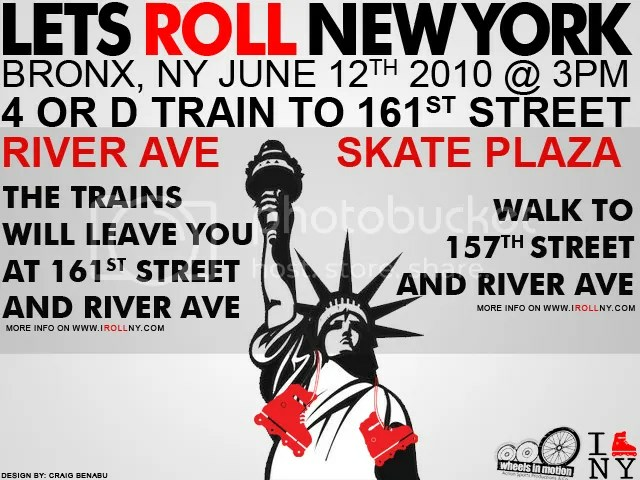 Lets Roll New York session 9 will take place this Saturday at the new Bronx river avenue skate plaza starting at 3:00PM. The plaza is located on River Avenue and East 157th street which is accessible by the 4 and D train station at the 161 Street-Yankee Stadium/River Avenue train stop. More info on the flyer above. LRNY X AOR BBQ Session Tomorrow! 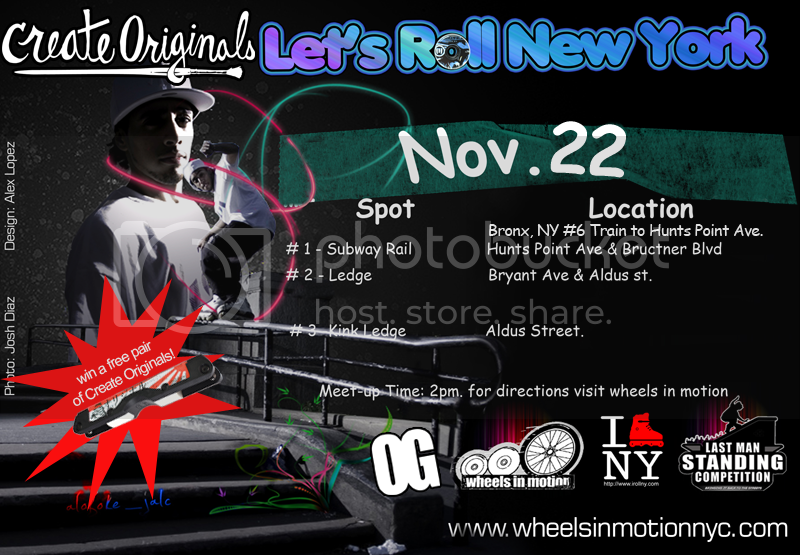 Tomorrow Wheels in Motion and the Art of Rolling will be throwing a BBQ session in Flushing Meadows Corona Park Queens, NY at 2:00PM by the infamous kink rail inside the park. The BBQ will serve as a fundraiser to get the next issue of the AOR magazine into print. Come out and show your support! 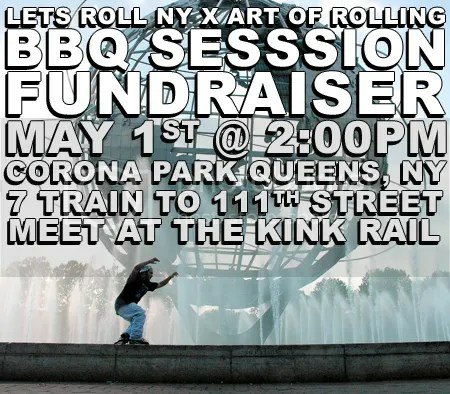 “This week Art of Rolling is teaming up with the Lets Roll NY sessions to throw a BBQ fundraiser for the skate community. We aim to raise money for the official premiere print issue of Art of Rolling Magazine. We are currently the 2nd most popular magazine in the worlds top rated magazine hosting site ISSUU, and we would like to take the next step to print and distribute Art of Rolling around the world. This Saturday May 1st come out and enjoy the beautiful weather and support the NYC skate scene in order to help present NYC skating to the world. Donations will be greatly appreciated. 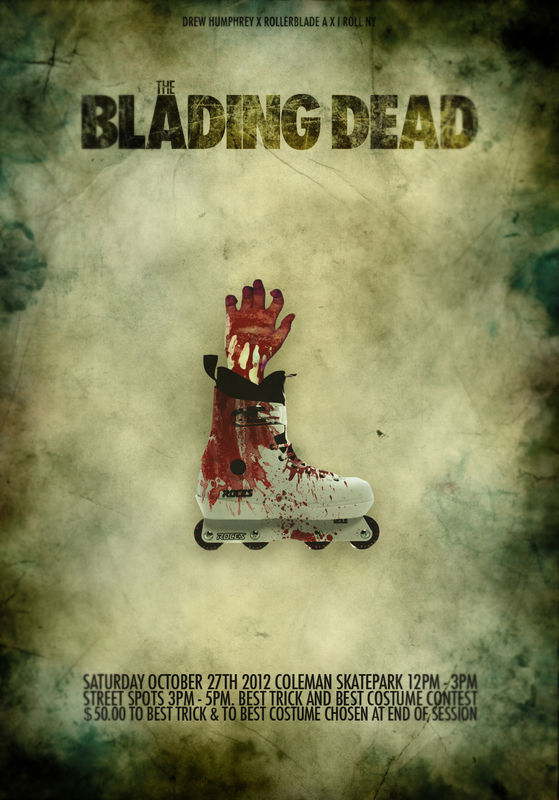 Come, skate and enjoy the first BBQ of the year” – AOR. Walking directions from the 111th street train station to Flushing Meadows Corona Park here. Check out some footage of yesterday’s huge turn out for Lets Roll NY session four. The edit includes Billy O’Niell, Justin Brasco, Arismendy Canela, Sal Zaso, Hector Rodriguez and many more. Filmed and edited by Joshua Martinez. Win Free Create Originals Frames Today! Today is the LRNY session in the Bronx, NY taking place at Hunts Points ave and Bruckner Blvd starting at 2:00PM. The Create Originals owners will be attending and giving out a free pair of the CO frames to whomever laces the best trick of the session. They will also have frames and tees for sale so make sure you’re in the Bronx today! More directions/information on the previous post below.